"BOOM it happened again, however, this time it was with the upgraded Maxxis tires, seems to me that a lot of these "trailer tires" are just plain garbage. The only positive thing I can say is that the Maxxis tires did not blow up like the TowMax tire did thus I suffered zero damage this time, call that a win-win. All tires were checked prior to departure and filled to 80PSI, less than 20 miles to our destination (220-mile trip) I saw a bit of smoke coming from right side pulled over and the side wall gave out. Changed it with the spare Goodyear Marathon that camping world lovingly overcharged me for last year ($197.67 to be exact) and went on my way very slowly. Why 4 you might ask, well it just made sense to me kids, wife & dog in the truck better safe than sorry. Took the three good Maxxis home with me as they look fine, may use one and make a second spare tire. Let's hope the Goodyear Endurance tires are as good as they say at least they are made in the USA VS the Marathon that's made in China & had a really bad track record. 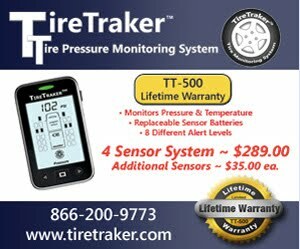 Anyways just sharing my experience will be purchasing a TPMS system very soon before our next trip that's for sure. Any recommendations? Seems many offer a six-tire system all I need is a 4 tire system." Sorry to see you had another tire failure but there is no such thing as a "failure-Proof" tire. All tires need to be properly inflated. ALL THE TIME. Not just at the start of a trip. The pictures provide the evidence with that nice 360 flex that resulted in one side ending up with just the bead area and lower part of the sidewall. This piece of convincing evidence is seen in upper left part of the picture. I hope you held onto the other 3 tires as there is no reason to expect them to fail as they apparently didn't lose air like the failed tire did. 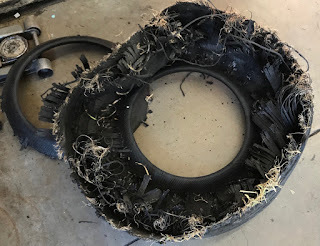 In case you wonder about my diagnosis you might review THIS blog post where I was provided with a number of sharp pictures of the failed tire. As covered in THIS post, 99+% of tire failures are due to one of two different causes. Your tire has clear and convincing evidence of failing due to Run Low Flex Failure of the sidewall. I would strongly suggest a TPMS be installed so you could get advanced warning of air loss. Note: I have even seen instances where the valve core sticks open and if the valve cap is not metal with an internal "O" ring the tire just takes longer to go flat as plastic caps are really, IMO only reliable at keeping dirt and small birds out of the valve core sealing ring. You might review THIS post on valve cores to understand why metal caps with 'O"rings or TPMS sensors are the only items I consider acceptable to use on the end of a valve stem.